I keep on meaning to do a Dreamtime on Pandora, the "internet radio station," that is much, much more than an internet radio station, but if I'm going to do a show featuring Pandora, it looks like I better move fast. According to various reports, including this one at TechCruch, and its companion Washington Post piece, Pandora, which has seemed at the brink of collapse for the past year, may finally be looking at the end. Why is a company that has a listening audience of 1 million a day, attracts an average 40,000 new listeners a day, and has one of the most popular iPhone applications available in the iTunes store on the brink of shutting its doors? Thank SoundExchange, brought to you by those wonderful people at the RIAA, who are nominally charged with collecting royalties on behalf of the artists for all work broadcast over the internet or satellite radio. I say "nominally," as many artists say they've never seen a dime from the millions that SoundExchange has reportedly collected, and many artists don't want SoundExchange doing anything on their behalf. But SoundExchange trucks on nonetheless. Consider this: Unlike what you might have thought, traditional over-the-airwaves radio stations pay not a dime for the music they play, although SoundExchange is trying to change that too. Satellite radio such as the newly renamed Sirius XM Radio pays around a royalty rate of 1.6 cents per hour per listener - at that rate, XM pays around $38,000 in royalties for each TTRH aired. That's an estimate, based on published reports that TTRH has a listening audience of around 2 million. The actual royalty figure is probably lower, as I doubt whether anyone is still collecting royalties on some of the music TTRH plays. In any case, the same music played on Pandora for an hour will cost the company almost double the satellite radio rate - an estimated 2.9 cents per hour per listener. Pandora estimates that rate will cost them over $17 million a year, or about 70 percent of their annual revenues. Which is way too much to pay out for the start-up to survive. Although not coming right out and saying it, Pandora CEO Tim Westergren is hinting that the time may be at at hand where Pandora literally pulls the plug, and shuts down. And that would be a shame. While Pandora isn't perfect by any means, I've been a fan since its launch and recently fell in love with it again thanks to its new mini-application for the iPhone and iPod Touch. Pandora, for those of you who don't know it, allows listeners to create their own "radio stations" which you can listen to through your computer, or now through an iPhone, and if you have a docking station for your iPhone, through your stereo or media center. 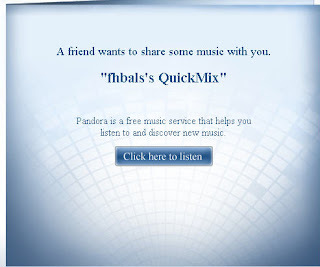 One of Pandora's quirks - again due to music licensing restrictions - is that you can't build a specific playlist or request a particular piece of music. You give Pandora an artist like Bob Dylan, or a song like Mississippi, and it goes out and creates a playlist based on music similar to your selections. Eventually you'll probably even get Dylan's version of Mississippi, but Pandora's strength - as well as its weakness - is through offering songs and artists that have something in common with your requests. It's a great way of discovering music you've never heard before. As I said, Pandora is not perfect, and can be quite quirky in its music offerings. I've always had this suspicion that the algorithm occasionally tosses in something that you'll almost certainly hate, just to ensure that you're paying attention.. However, if Pandora coughs up a particular piece of music that you really dislike, you have the option - within limits - to get it off your playlists. Over the last couple of years, I've been building various Theme Time playlists in Pandora, using the artists and music from shows stretching all the way from Weather to Cold as my templates. An example of the results can be heard by clicking on the image above. Some of the music on my TTRH stations is pretty good, if not quite as good as what Our Host might pick. And some of the music is exceedingly strange, such as my Mother station, as one might expect from a playlist that includes stuff from LL Cool J, the Rolling Stones, Merle Haggard, and Ruth Brown. The Drinking one is pretty weird too. As Michael Arrington notes in his TechCrunch article, what entities such as the RIAA, SoundExchange, and the record labels don't seem to get is, "Recorded music is nothing but marketing material to drive awareness of an artist" Period. The end. Pandora and other internet radio entities, satellite radio, traditional radio all should be considered valuable marketing and advertising tools, not another revenue stream to try to shore up the music industry's failing business model. In fact, I think a strong case could be made that the various record labels should be paying Pandora, et al for promoting their music. And yes, I know what I'm talking about is payola, but you know what, that's not necessarily a bad thing. What's wrong with a, "this hour of music was presented by Sony, Arista..." NPR-like announcement at the beginning of each hour of Pandora? Good music will still rise to the top. Crappy music will sink. Play enough crap and you'll be out of business, no matter how much payola you're taking.